I had dinner with 2 friends here last night and for an enjoyable meal at a very convenient uptown spot, I was glad it was suggested. When we walked in, we were greeted by a friendly hostess and seated immediately. She asked us the name of our 3rd party who hadn’t arrived yet, and sat us in the dining room. The vibe is warm and cozy, decorated with dim lights, primary colors, and authentic (I think) Mexican statuettes. It had the faint smell of a fireplace, which added to the ambiance on a chilly, rainy, winter night. It is a much bigger space than I thought, and I wondered how I had never been there before. Nice touch: When our third party arrived a little later, he was immediately greeted by name and sent over to us. Water glasses were quickly filled. Fresh tortilla chips in 3 bright colors (red, yellow, and green) were put on our table (and speedily refilled when we polished them off) with their accompanying salsas; a spicy green one, a chunky tomato salsa and a smoother red salsa. Drink orders were taken- I had a mango mojito that was sweet, summery (wishful thinking) and delicious and my friends had margaritas that they loved. Upon my friend’s recommendation, I had the Enchilada De Pollo con Mole. It was SO tasty and the perfect meal on such a damp, cold night. 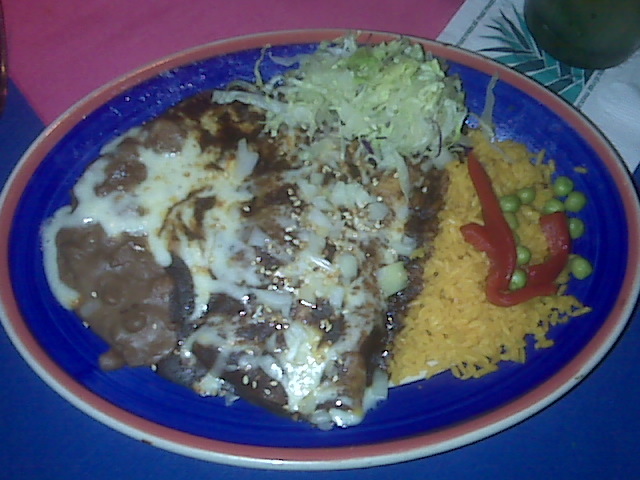 Served with sides of yellow rice and refried beans, even though it was very filling I cleaned my plate. We looked over the appealing dessert menu, but none of us had any appetite left. We also couldn’t really see why Ben & Jerry’s Ice cream would be on this menu- especially at almost $7 for a serving. I know that in the warmer months they have a lot of outdoor seating and I will definitely plan to revisit at that point. I was very impressed with the efficient and polite service, we had at least 2 people waiting on us and making sure that our water glasses were kept full. A delightful neighborhood spot that I will certainly return to. Muy bien.